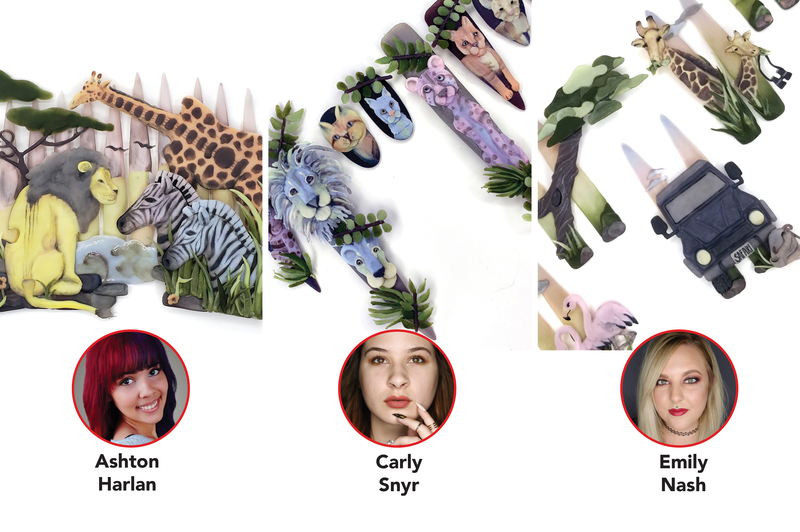 Challenge 2, sponsored by Mia Secret, asked the Top 11 to use two acrylic collections to create safari-themed nail art across 10 nail tips. This week’s guest judge was Blanca Martinez of Mia Secret. Ashton: The judges agree that bringing in your personal story gave your nails a unique perspective that really made them stand out this week. The shading and composition of your artwork along with the pro tips in your video were other highlights from your entry this week. There was some debate as to whether or not these tips were truly separated from each other, but all in all, your work this week hit a high note. Carly: You used Mia Secret’s Pastel Macarons collection in an unexpected way and showed us a cohesive design while varying colors, tip shape, and size. The judges praise your narration but advise you to include a few more pro tips. More detail on some of your cats would have increased your score that much more. Overall, a fierce feline set! Emily: You gave us a clean, detailed design that consisted of balance and harmony in terms of color and composition. Your interpretation of the challenge was literal, albeit extremely well-done. The judges encourage you to step outside of the box and show us more of who you are as an artist, because you are obviously a brilliant one. Overall, your video was well-liked, but could be tightened up even more at times. Bojana: Your pastels were on point for this challenge. The judges wished they had seen more of the Grey Jungle collection and more of your nail tips in focus in the frame of the video. Jenna: The inspiration behind your challenge this week made you stand out. Unanimously, the judges loved the background of your piece. Work on the pacing and aspect ratio of your video. Push tighter with greater consistency of view. Kelsey: Your animals are realistic and the artwork that went into this set is so appreciated. The coloring, however, is a bit dark. Using more of the pastel collection may have lightened this up. Amazing video! Lorna: Your overall work is very clean, but the judges crave more detail on your 3-D figures (the flamingo in particular). Watch the text in your video. The white font against the white background is hard to read. The snake, however, was the star of the show, as were your pro tips – keep them coming! Nixxi: “WOW!” is all the judges could say after watching your video. We cannot tell you how much we appreciate this huge risk you took with your technique. At the end of the day, though, this was an acrylic challenge, and you may have missed the point by not taking advantage and showing us your awesome 3-D art skills (which we know you have). Still, color us impressed. Ashley: It’s agreed among all the judges that your detail work is artistic and defined, but you need more balance of color. It’s recommended that for your videos you try grouping your techniques to streamline them and weave in your tips throughout. Melisa: The judges liked the gilding of your safari animals and your cute approach to the theme. Slow down your video so we can see the detail work you’re doing. Also, the text you’re placing in your video isn’t necessary. Stella: Your work this week was extremely clean, but the judges worry it may have been too predictable and minimal for NTNA. Make sure you are zooming in closer so we can see your work in your video.